My favorite television political analyst, Lawrence O’Donnell went after GOP presidential candidate Mitt Romney over his flip-flop about the Blunt Amendment. The Blunt Amendment, proposed by Republican Missouri Sen. Roy Blunt (a Romney supporter) would give employers the right to ban contraception and other healthcare provisions due to moral objections. Sounds to me like Romney is against the Blunt Bill AND that he believes it is none of his business how adults deal with contraception AND that this topic has no place in presidential politics. Right? 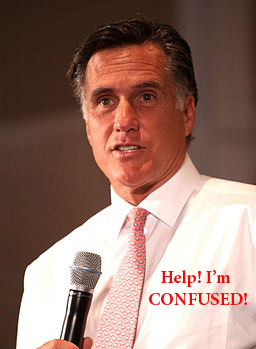 Unfortunately for Romney, the GOP and President Obama have turned him into an even more uncomfortable and confusing candidate. When the economy was tanking and Americans were really pissed off about the U.S. debt and unemployment, Romney was able to talk about the economy without any major missteps beyond how he was going to pay for his economic recovery plan. His presidential candidacy was always about his business acumen and how he had the managerial and financial experience to get America back on its feet. Then the economy started to improve along with Obama’s approval ratings, which has led the GOP to go back to its political bread and butter, connecting social issues to family values or as it’s sometimes called ‘gays, guns and god.’ Of course now they’ve added vaginas to the mix. Social issues aren’t really high on Romney’s presidential radar beyond denying his support of Romneycare. Now he’s had to talk primarily about issues that don’t interest him nor have been of any real concern to him such as women’s healthcare and reproductive rights. As a result, when he’s asked a question about social issues, specifically on contraception, he sounds honest and sensible; forgetting to quote from the ‘GOP policy handbook on social issues.’ The words were barely out of his mouth before the GOP told him he screwed up – again. Romney’s party and his opponents have twisted him in so many political knots that they have contributed to the group think about Romney’s disingenuous personality. It has gotten so bad that you can practically see him trying to think of the best answer to the question and its ramifications while he’s trying to answer them. You almost feel sorry for him. If Romney becomes the GOP presidential nominee and then subsequently loses to Obama, he will take the brunt of the blame for the GOP’s election failure. But would it really be his fault alone? I think that he’s as much as fakers as he is a liar. If anything, Romney is faking for the base of the Republican Party, for Teabaggers and Evangelicals, while lying to himself. The lie is that somehow, a moderate Republican who loves to talk about money and Mormonism can somehow run for President for five years and not share his true self in public. There are few things sadder in life than someone being as untrue to themselves as Romney is now.